Ladai goliyon se nahin, dil se jeeti jati hain. Hindi cinema has never had a strong tack record in the sci-fi and fantasy genres. Its product has tended to focus on the musical rom-com, melodrama and tragedy - sometimes all bound up in the same film. There have been successful gangster, cop and thriller movies, and a consistently rich seam of independent cinema. But with a few recent exceptions - KRRISH, perhaps - Hindi cinema hasn't really ventured into the lucrative arenas (in the West, at least) of children's animation, fantasy, horror, and sci-fi. Perhaps this reflects the fact that all these genres need state of the art technical expertise of the kind that up until recently wasn't available in Mumbai - surprisingly so, when you consider India's considerable edge in IT. But IT in the creative industries - that's something quite different. Moreover, these films need considerable and expensive post-production work - again not the kind of facilities easily accessible in Bollywood. All this pre-amble gives you some idea as to how revolutionary RA.ONE is. Because this isn't so much a new film, to be reviewed as other films are reviewed, but a statement of faith in the future of Hindi cinema on the part of its star, legendary Hindi actor Shah Rukh Khan, and his wife and now producer, Gauri Khan. RA.ONE represents a massive gamble, and indeed investment, on their part - in creating production facilities in Mumbai - in using the best post facilities in London for effects and retrospective 3D. They have shown the world that Hindi cinema can now produce movies of technical skill to match anything Hollywood has to offer, and the box office receipts show that Indian audiences are quite willing to embrace the relatively new genre of sci-fi action thriller. To that end, RA.ONE must be seen as a technical and commercial success - a seminal film - regardless of the quality of the actual work. The movie itself is far more conservative than the radical technical achievement. The story is a strange and not entirely felicitous mash-up of elements from TERMINATOR, THE MATRIX, and TRON, shoe-horned into a typical Hindi family comedy. Shah Rukh Khan plays a nerdy video game designer called Shekhar, married to his loving wife Sonia (Kareena Kapoor). In order to impress his alarmingly feminine-looking son, Prateek (Armaan Verma), Shekhar invents a game in which the bad guy always wins. Problem is, the bad guy avatar, Ra.One (a play on the Hindi name of an evil demon, Raavan) breaks free of the computer game and enters the real world, desperate to kill his gaming foe Lucifer, the avatar of Prateek. Only the good guy avatar, G.One (a play on the Hindi word for "life", Jeevan), modelled on Shekhar, can save the day. The scenes of family life, with Shekhar and then G.One playing husband and father, are classic Hindi schmaltz. It's a culture in which the family unit is idealised - where father is always right, mother is entirely dependent on father (despite a brief reference to feminist research), and the little kid is a spoilt brat who comes to realise that, well, father was right all along. There are schmaltzy scenes of bonding, and Shah Rukh Khan's brand of typically broad, crude comedy. He does things here that are so simplistic - donning a stupid perm wig to simulate being a geeky southern Indian - that no other actor would get away with. But accusations that Shah Rukh Khan is a hammy actor are beside the point. His fans want to see through the thinly veiled disguise of costume and antics to the superstar beneath. He is his own brand - losing himself in characterisation would be alienating to his admirers. The handling of the sci-fi material is also pretty cursory. This isn't THE MATRIX - posing deep questions about the nature of reality and perception. The explanation of how Ra.One and G.One can escape the video game is all a bit Basil Exposition. No-one here is really interested in the philosophy. But I have to say that I did appreciate the almost self-effacing way in which the screenwriters (David Benullo, Kanika Dhillon, Niranjan Iyengar, Mushtaq Sheikh, director Anubhav Sinha and Shah Rukh Khan) acknowledge this fact. Shortly after the interval they insert a scene where Sonia, Prateek and G.One meet Rajnikanth in the role of Chitti - the robot come to life that he played in the recent Hindi film ENDHIRAN - a much more subtle and intelligent investigation of the nature of virtual reality. Sonia explicitly pays homage to the superior creation. Where the film scores big is in the use of CGI and the staging of the action scenes, that surpass anything in recent Hindi cinema, and even surpass second-tier Hollywood action flicks like THE GREEN LANTERN and THE GREEN HORNET. The imaginary worlds look amazing, Shah Rukh Khan looks superb in his blue-lit suit, and the set-pieces are just stunning - particularly a train chase sequence that culminates in the (subversive political?!) destruction of Mumbai's colonial Victoria Terminus railway station. I also liked the in-jokes - the inclusion of Desi girl jokes at Priyanka Chopra's expense, for instance. And, of course, completing the cross-cultural switch, we have the American rapper Akon singing the two key songs that frame the big musical item numbers. These scenes work really well, and it's actually pretty surprising to see how convincing Akon is singing Hindi lyrics, although this is undercut by the absurdity of Khan lip-synching to them. 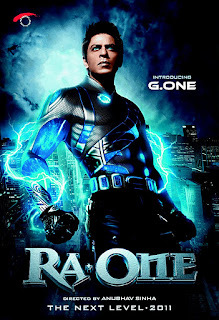 Ra.One is also one of the more successful retrospective 3D movies of recent times. Overall, it's easy to knock RA.ONE - the plot is shaky, the sci-fi exposition cursory - and it's basically just another vehicle for Shah Rukh Khan's brand of cheeky family comedy, newly supplemented by his buff physique. The movie was never trying to be a subtle sci-fi thriller. What is was trying to do was lay down a new benchmark for CGI-packed action films. And in that respect, it's an unqualified success. RA.ONE went on global release on October 26th. You don't like Ra.One. Big deal. I love it. It is one of the few movies including Darr, Baazigar, Don, MNIK, Asoka where you will see an amalgamation of two cultures of film making -the east and the west. If Spy kids and Tron are ignored, Virtuosity is the only movie which has a virtual character played by Russell Crowe. And since the characters in the game in Ra.One were self-aware and adaptive owing to the artificial intelligence, the robot plus humanoid acting was to the point. Thesis on cuss words which are actually based on women and their body parts is actually progressive. The sense of humour like crotch jokes is similar to Deadpool. Also a video game character being a superhero is an original origin story which none of DC and Marvel has. The fight scenes are also quite original, and uses mutliple bullet time shots as in Matrix which is justified here and also the end with ten RaOne's is a nod to the mythology where the demon Raavan had 10 heads. The technology is actually possible because of research in Internet of things, Artificial Intelligence and Virtual and Augmented Reality concepts. For example Google VR and Pokémon Go respectively. Also it has original special effects of cube formation and blasts which are different from IronMan but closer to Dragon Ball. Infact similar special effects are used in The Amazing Spiderman 2 where the character Electro is nothing like in the comics. Adam Sandler's Pixels basically ripped off the concept of Ra.One although it may have been an idea formed out of Wreck it Ralph. The message is quite wonderful because considering the attraction and indifference of kids towards violence in games, movies, tv shows and badass characters is alarming. Cheers!